Epoxy and urethane floor coatings are unquestionably, some of the most durable floor coverings for concrete slabs. They are available in a very wide range of colors and can be customized to provide almost unlimited choices to suit nearly any design aesthetic. One way to customize and make an ordinary floor extraordinary is by incorporating the use of a decorative metallic flooring system. The result will be a high-luster finish, utterly unique to your facility. What is a decorative metallic epoxy and urethane floor coating? This innovative decorative floor coating system utilizes clear UV-resistant epoxy, into which a metallic pigment is added. Metallic pigments are tiny, almost glittery particles that produce a pearlescent or iridescent effect. When blended with the epoxy, the particles create an exciting visual effect having multi-dimensional hues. What are the benefits of a decorative metallic epoxy and urethane floor coating? How is a decorative metallic epoxy floor coating installed? Mechanically prepare the surface of the concrete slab in accordance with the Tennant Coatings Metallic System Guide, ensuring it is smooth and free of dust, dirt, or any foreign particles. This step may also includes testing for Moisture Vapor Transmission. Apply an opaque primer and basecoat, which will serve as a background to the shimmering semi-translucent metallic epoxy layer to follow. The color of the basecoat will influence the final appearance of a decorative metallic floor coating system. Apply the clear epoxy mixed with the metallic pigment coating. Pour one color onto the floor, randomly squeegee it around the floor. Then, use a roller to move a second color randomly through it. Instead of using a roller for the second pigment, spatter it to create a random pattern. Spritz, splash or flick different solvents onto the tacky undercoat; each delivery method and/or solvent will result in a different type of appearance and end product. Using a leaf blower you can move and create different cloud like patterns as the air pushes the metallic around. Achieving just the right effect is the result of vision, creativity and experience, all of which our team of flooring experts at Tennant Coatings can provide. 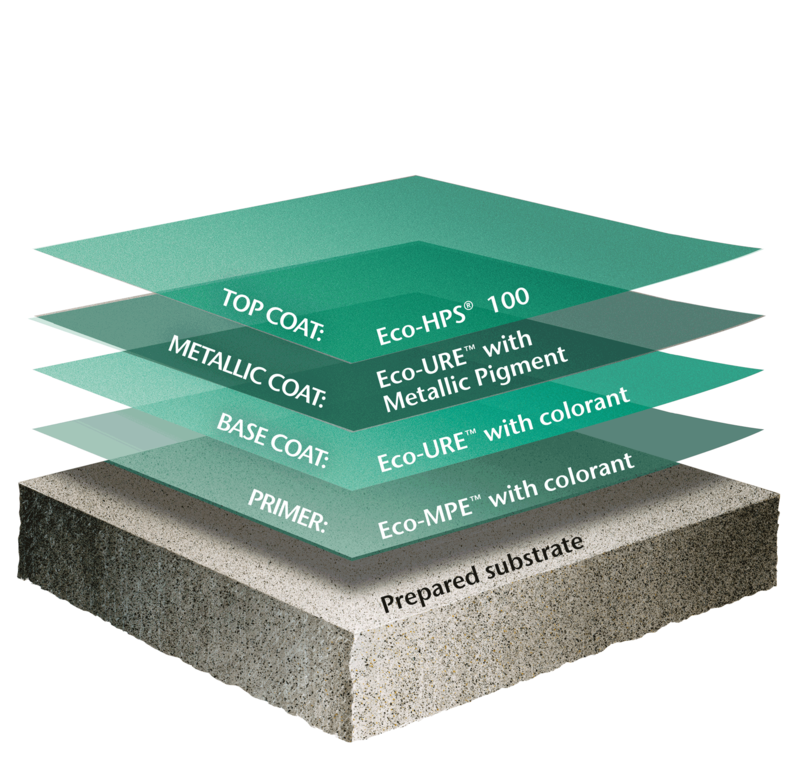 Tennant Coatings offers two decorative metallic systems, both of which come with a primer and a base coat that include colorants, a metallic coat, and a top coat—either Eco-HPS® 100 or Eco-HTS™ 100. We have developed our systems and products to meet the same high standards of quality that have made Tennant Company the world-wide leader in commercial and industrial cleaning equipment for years. For your metallic flooring needs, contact us today!